Ever since my lactose intolerance self-diagnosis, I've noticed a significant decrease in bloating and indigestion. My body feels so much better on a dairy-free diet, and I'm no longer self-conscious about a protruding waistline after pizza and ice cream (for reasons other than weight gain, of course). Here's the thing: Technically, most people are unable to properly digest dairy products. And if you're particularly sensitive to the food group, you'll notice bloating, gas, constipation, and inflammation (in your skin, too). However, even after nixing all dairy from my diet, I still bloated from time to time, so I was desperate to find something else that would help. Enter Urban Moonshine. The natural digestive aid company swears by bitters to help prime your body for digestion, fend off sugar cravings, support healthy liver function, and so much more. No, we're not talking the type of bitters you put in your cocktail, but rather a drinkable concoction that you sip (or spray) before meals or when you've got a case of the munchies. Intrigued by this idea (albeit a bit put off by voluntarily tasting something bitter), I decided to give it a try. Keep scrolling to read how it works. Jovial King, co-founder of Urban Moonshine, explains the magic of bitters: "As human beings, we evolved eating tons and tons of bitters—bitter greens, bitter roots, bitter barks. Fast-forward to modern times, and as a culture, we consume an immense amount of sweet, salty, and processed food, and we have a severe lack of bitterness. "But our bod­ies are built for bitter flavors! Bitter engages and excites the digestive system. Bitter challenges the body, alerting it through taste that a complex food is being ingested, more complex than heavily processed food. It is very important for the body to have enough challenge—challenge keeps us strong, on our toes, and ready for action! Bitters are like the gym for the digestive system—they help to keep it toned." Secondly, bitter taste stimulates the secretion of polypeptide YY, which reduces food intake in subjects of normal weight, so researchers decided to test the effects of the peptide infusion on the appetites of 12 obese and 12 lean subjects in a double-blind, placebo-controlled crossover study. The participants were offered an all-you-can-eat buffet lunch, and following the meal, researchers found that caloric intake decreased by 30% in the obese subjects and 31% in the lean subjects. As such, Jovial insisted that if I spritzed some of the bitters like Binaca into my mouth when I had food cravings, they'd go away. She also told me to try the bitters pre- and post-meals for less bloating. So, as I was told, when the urge to run to the kitchen at work and grab some snacks came on, I instead reached for some Maple Organic Bitters Spray ($9). I opted for the maple variety to make the taste more bearable (though it's still a bit too bitter for my liking), but within seconds, the taste wore away. It almost has a numbing effect, but in a weird way, I no longer wanted to eat a snack. Perhaps it was because my tongue had just tasted something undesirable, but I couldn't believe that it was actually working. I continued doing this for a week straight and found the same results each time. As far as the bloating, I didn't notice a "puffy tummy" (as I like to call it) when using the bitters. It's amazing how much your mouth actually begins to salivate when you taste something bitter, as it's prepping for whatever you're about to eat. But interestingly, even though it's telling your body that food's on the way, it can always stave off the urge to eat, too. It's a little confusing, but hey, if it works, it works. To get a registered dietitian's take on the effectiveness of bitters, I turned to Alexandra Miller of Medifast Inc. While she believes in the power of bitter taste, she's a bit skeptical about its ability to stave off a sweet tooth: "Many bitter foods are rich in nutrients, including dietary fiber," she says. "Fiber helps fill us up and keeps us satisfied, which is extremely helpful for people trying to lose weight and/or combat cravings. In addition, fiber helps promote healthy digestion by affecting the rate of digestion, the absorption of nutrients, and the movement of waste products through the colon. "Bitter fruits and vegetables are also lower in calories and full of vitamins and minerals, which makes them great for people looking to lose weight. Some people find that bitter foods help curb cravings by suppressing their appetite; more research is needed, however, to support this claim. Examples of healthy bitter foods include arugula, dandelion greens, chicory, sorrel, mint, broccoli rabe, Brussels sprouts, chard, cranberries, grapefruit, kale, rhubarb, turnip, and turmeric." So there you have it: For me, the bitters helped with cravings. Perhaps it was a bit of a placebo effect, but physically not experiencing bloat while using the spray made me think the concoction really works. 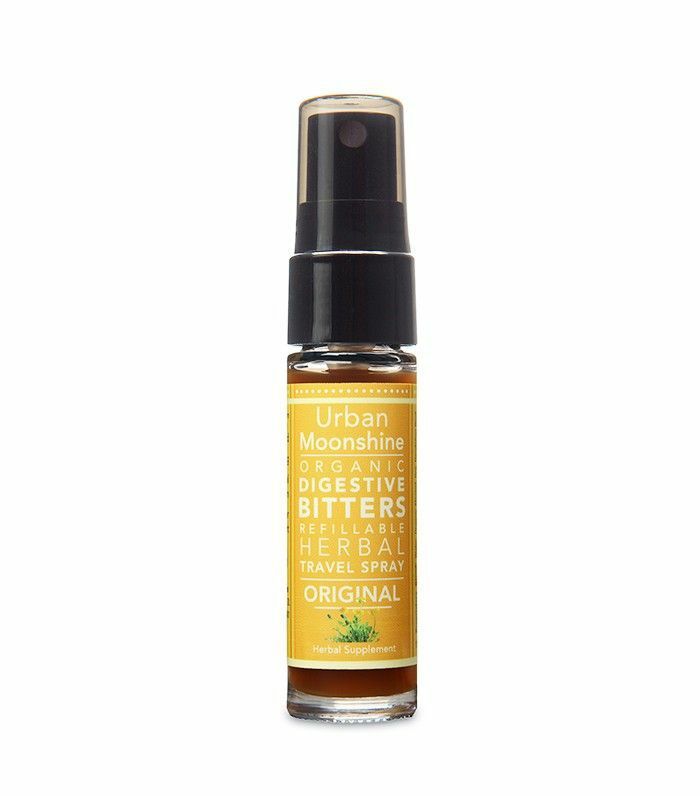 Interested in giving bitters a try? Let us know how they work out for you in the comments!